Parents of small children all over Tampa Bay were dismayed last September when Hurricane Irma forced the postponement of Peppa Pig Live! at Clearwater's Ruth Eckerd Hall. But there's good news -- the show has been rescheduled for Thursday, May 24 beginning at 6:00 p.m. And the even better news -- there are still a few tickets left for sale! Peppa Pig's Surprise! is a theater show with life-size walking and talking puppets of the characters from the incredibly popular British cartoon. 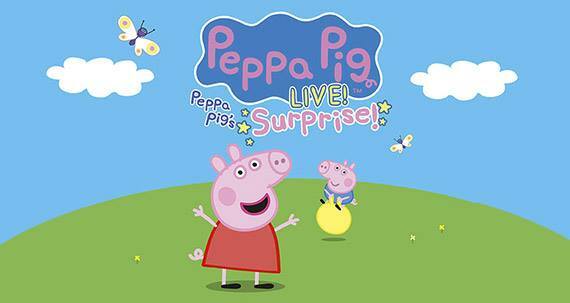 In this show, Peppa Pig (oink) and her brother George (oink oink) are playing in the garden when Mummy Pig (ooiinnnnkkk) and Daddy Pig (OOOOIIIIINNNNNKKKKK) come to say they have a surprise for them. No matter how hard they try, though, Peppa and George can't guess what the surprise is. If you purchased tickets for the original show date of September 17, 2017, your tickets will still be valid for the new May 24 date. Tickets with either date on them will be honored -- no need to go to the box office to make an exchange. If you couldn't go before, or your child wasn't interested in Peppa Pig before now, there are still a handful of tickets for sale at the Ruth Eckerd Hall box office and online. Regular tickets sell for $33.75, and there are a few VIP seats left too. With those, you get a seat in the first 15 rows of the theater, a meet and greet photo opportunity with the characters on the "pink carpet," a party after the show, healthy snacks and water, plus a free Peppa Pig lunchbox. This Clearwater performance of Peppa Pig Live! is sure to delight young children taking in their first live theater experience. It will be just as much fun as jumping up and down in muddy puddles! For more events happening in Pinellas County, as well as family-friendly activities, keep reading 727area.com. While you're on the site, sign up for free email updates so you always know what's coming to town (or coming back to town)! Photo from the Peppa Pig Live! event page on 727area.com.